Your website isn’t “Field of Dreams”…..if you build it, they may not come. Methodical work to promote your site and make it search engine friendly pays off with high rankings on Google. But what if Google isn’t giving your site the rankings you expect? Google admits to making hundreds of updates to their search algorithms each year, often to reduce fraud and “gaming the system.” The company’s goal is to provide the absolute best search experience for their users so they are constantly refining. So what does this mean for your website? First, make sure your site has an SSL (secure socket layer) certificate. SSL encrypts all communications while in transit. The Chrome web browser has begun to prominently flag websites that do not use the HTTPS protocol. This is low hanging fruit – it’s easy – get your IT group or web development partner to buy and install an SSL certificate. For more information on Google’s approach, read this article. Second, it’s strongly suggested that you make sure your website is responsive, meaning it works gracefully on all devices. Google’s goal is to effectively serve ALL users, regardless of the device they are using to access the web. This means that Google will identify a site as “less relevant” if it is determined that a user can’t have a good experience if trying to view the site on a smartphone. This one is a bit more involved to resolve. Sometimes an existing site can be optimized for display on smartphones. Other older sites may require a website re-design. Speak to your internal marketing group or a trusted web design and development firm for advice. Paying attention to these two issues will go a long way towards earning Google’s love. Once a report is done, share it via static PDF or grant permission to colleagues to view and edit the report via the Google Data Studio dashboard. Authorized colleagues can collaborate on the report real-time, such as changing the date range of the report to track data trends. The bottom line is that Google Data Studio may help your organization get more value from your data. Still in beta, it is expected that Google will continue to add features and functionality. For example, the tool does not currently support the import of behavior flow graphs from Google Analytics. So give Google Data Studio a test drive to see if your organization can reap its benefits. There are numerous options for learning to use Google Data Studio or reach out to a consultant to help you get started. Has all the talk about the significance of “big data” left your company stymied about where to start? At the 10,000 foot level, we turn to data, big or small, to help inform our business decisions. Where should research dollars be spent? Which marketing campaigns are having an impact? Do we have a clear understanding of our company’s competitive advantage? These questions can be informed by analyzing “little data”. Think of little data as “small dose” data. Little nuggets of gold that we likely already have at our fingertips via data analytics, legacy databases, or possibly government managed, public data sets. But whatever the source of the “little data”, it’s significance will partly be determined based upon how that data is shared. Simply having access to the data does not provide value. You need to decide how best to make that data consumable by your audience, regardless of whether the audience is your executive management team, your sales team or current and potential clients. Web and mobile data reporting enables users to select filters and display relevant data real-time. In simple terms, a front-facing, user-friendly interface enables non-technical users to manipulate the database to display data based upon selected filters. It is possible that the online report may combine data from more than one data source. This can be an effective way for an organization to enhance their internal data with complementary data from a different source. For example, for some of our biotech clients, we combine data from their internal sources with additional data from the Centers for Medicare and Medicaid Services. Infographics are a way of combining text with images as a mechanism for sharing data content. Infographics can be static (meaning they don’t have any moving parts) or interactive (which allows users to solicit action by hovering or clicking with their mouse). The significance of infographics is that they are typically very engaging and easily scanned by the eye. So within a few seconds, the user can get a quick snapshot to start to understand the data. As an example, check out this infographic developed for Consumers Union to share healthcare value strategies. Decision support tools are a mechanism for making data accessible to users for the purpose of making an informed decision. As an example, the New York State Department of Health sponsors a Consumers’ Guide to Health Insurance. Using data compiled from the health department, as well as the New York State Department of Finance, the web application provides easy-to-access, filterable data regarding quality and complaint data on health insurance providers. This is the value of decision support tools: bringing hard-to-access data into the hands of people trying to make an informed choice. Real-time calculators are way to provide an “if-then” experience to the user. An interactive online report is developed that includes user input fields. The user enters the inputs and clicks ‘submit.’ An online report, reflecting the specific scenario entered by the user, is then displayed. Calculators can be useful for displaying data related to revenue impact, budget trends, healthcare outcomes, etc. Animations are becoming increasingly popular as a mechanism for engaging and sharing data in a unique way. Using animations can be particularly effective for training and education purposes. The process of creating these types of animations includes transforming the designed animations into small videos which are then played within the browser. Tools such as Canvas are helping to make the creation of animations more easily attainable. The Washington Post did a great job using animations to educate about the benefits of fitting in workouts while at the office. The bottom line: determine if your organization has “little data” that isn’t being put to its best use. If so, it’s time to start strategizing about how you can capitalize on the data to support your organization’s short- and long-term goals. For detailed instructions, see Google’s checklist. The last step is to change your domain in Google Analytics to https. By doing so, Google Analytics will recognize your site and continue to track your site data. 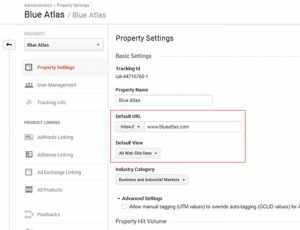 Simply log into your Analytics account and navigate to manage/property settings. Update the “default url” to “https” and “default view” to “all website data”.